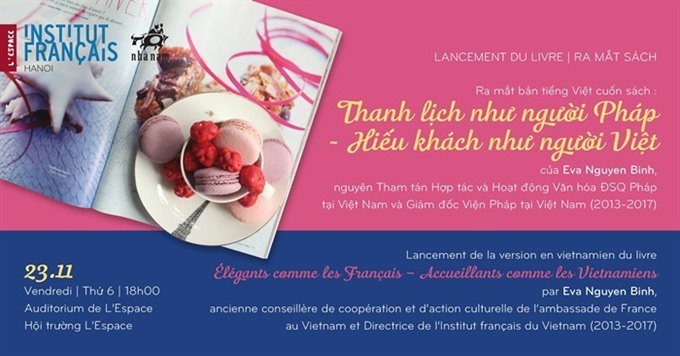 A book launch of As Elegant as the French – as Welcoming as the Vietnamese will take place at L’espace on November 23 at 6pm. HÀ NỘI — Former director of the French Institute in Việt Nam, Eva Nguyễn Bình, will present her book Thanh Lịch Như Người Pháp – Hiếu Khách Như Người Việt (As Elegant as the French – as Welcoming as the Vietnamese) with a launch at l’Espace tomorrow, November 23, at 6pm. As Elegant as the French – as Welcoming as the Vietnamese is a book that brings together sophisticated, sometimes sarcastic, yet endearing observations by the author on the differences in manners, lifestyle and cultural habits of the French and Vietnamese. From the way you sit at the table, to the way you present gifts and the way you dress, there are many subtleties that can cause surprises or even misunderstandings. Born to a French mother and a Vietnamese father, Eva Nguyễn Bình spent four years (2013-17) working as director of the French Institute in Việt Nam, and as a counselor at the Technical and Culture Co-operation Department at the French Embassy in Hà Nội. The book is not simply a textbook, but rather a handbook that explains the differences so that Vietnamese can better understand the French and vice versa, with the French in particular and foreigners in general.